What dimension of perversion do you live in when you think it’s okay to explore the sexuality of a four year old child? 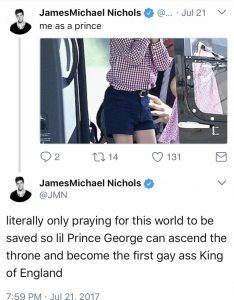 “Prince George has become a gay icon overnight — at least, that’s what some people — sorry, his subjects — are saying on Twitter” the article said. Only a twisted mind could take an image of a child and describe it as an iconic symbol of a lifestyle that is defined by its sexuality. So there you have it folks. 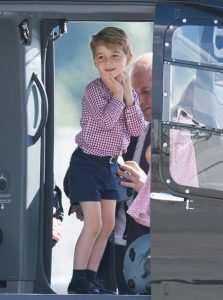 If you’re a cute, well-dressed child then you’re a gay icon. For a group that is trying to legislate and normalize a lifestyle and sexual preference statements like this are wildly hypocritical. If one were to accuse an effeminate man of being homosexual it could be classified as judgemental hate speech based on appearances. The inability to see a child that is expressively excited about his experience without espousing your agenda demonstrates a lack of mental and moral capacity that needs to be rebuked. England already has a queen. Stop trying to give them another one.